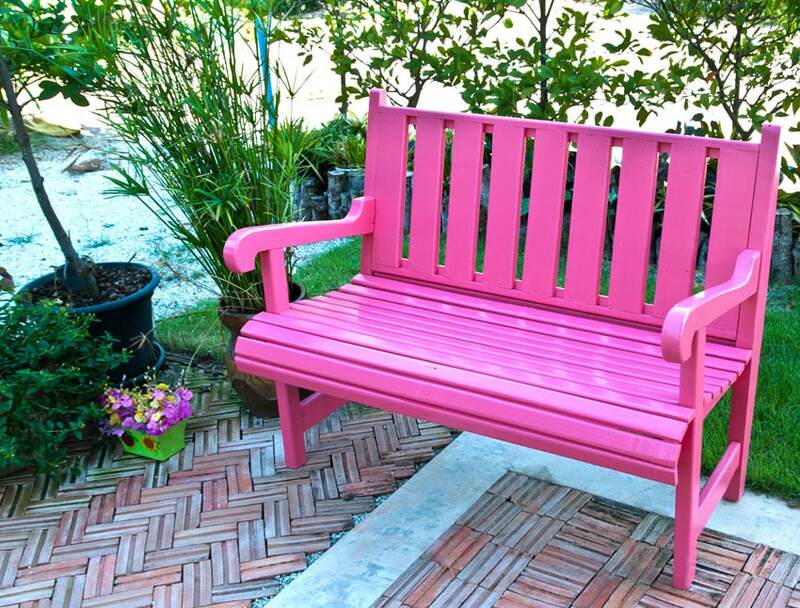 Here we showcase a variety of attractive outdoor bench ideas. 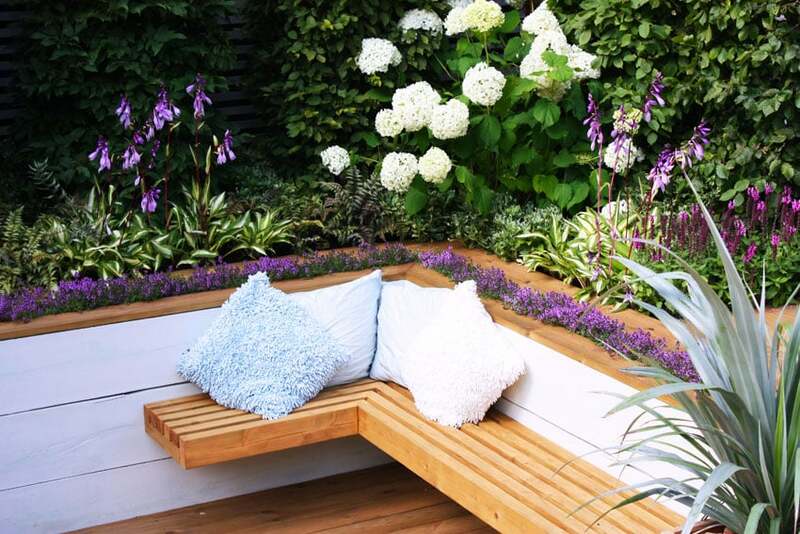 An outside bench can be a great way to fully enjoy your backyard, patio or garden area. 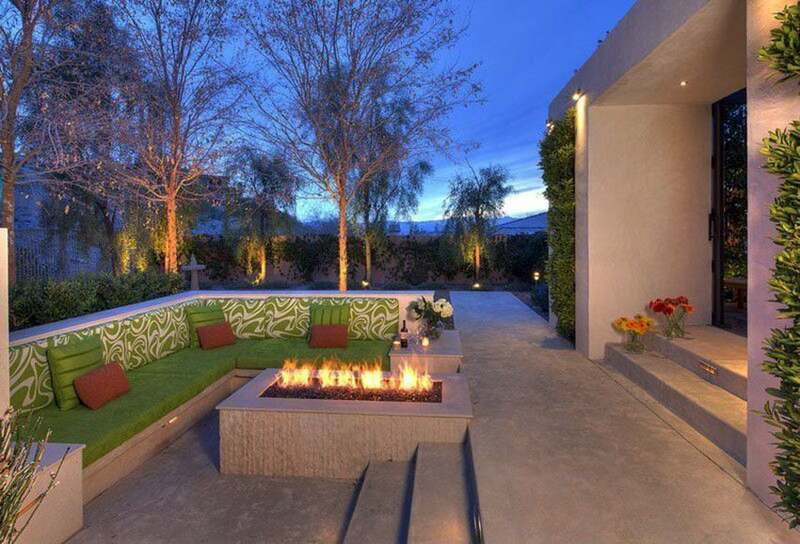 They can be used as a seating area around a fire pit that family and friends can enjoy. 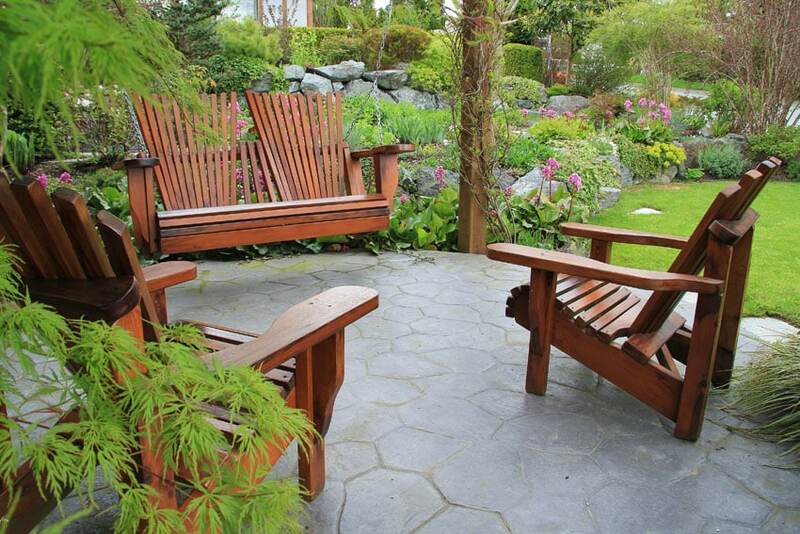 Benches can also be used as a place for private contemplation, or to extend your home’s outdoor living area. 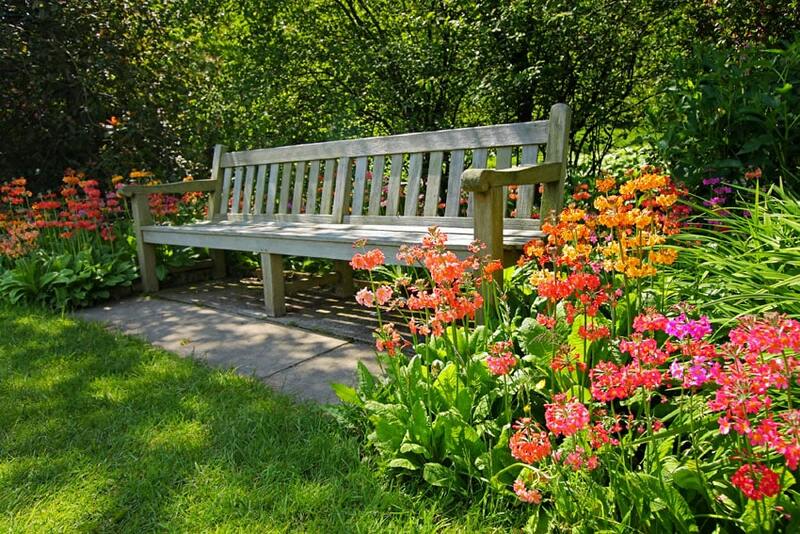 Below you’ll find a variety of outdoor bench designs that you can use for inspiration for creating your own inviting backyard space. 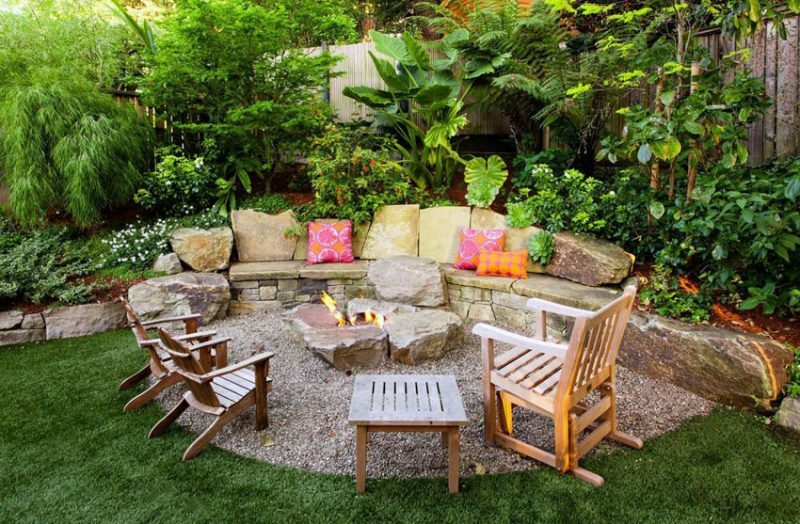 Surrounded by lush green grass and a backdrop of tropical plants, the stone fire pit with curved stone bench pictured above is the perfect backyard spot to relax. Decorated with neon pink and orange throw pillows and accompanied by a set of sturdy wooden furniture, the whole family can come together over the warm fire. Beige pebbles line the circular patio space providing a change in texture from the grass. For most people, the garden is their house’s pride and enjoy. With urbanization and rapidly rising real estate costs, owning a wonderful oasis of your own is a modern privilege. 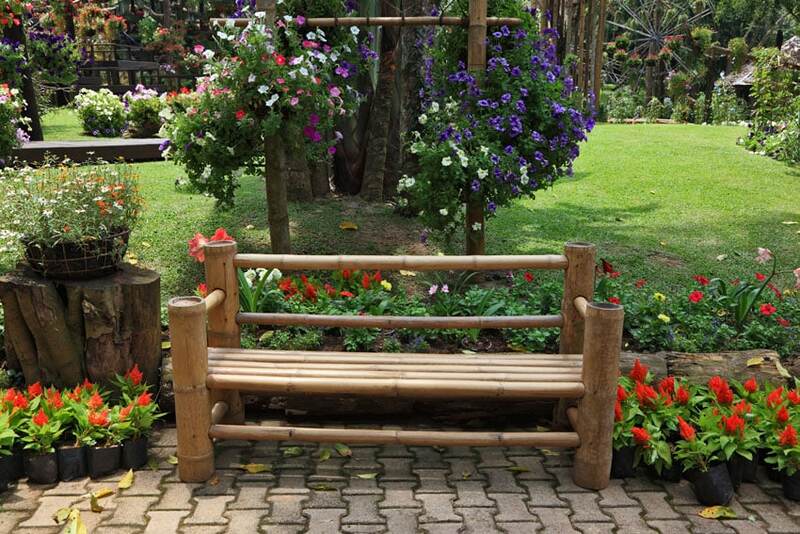 People blessed to have beautiful gardens should have great seating space from which to admire their handiwork. 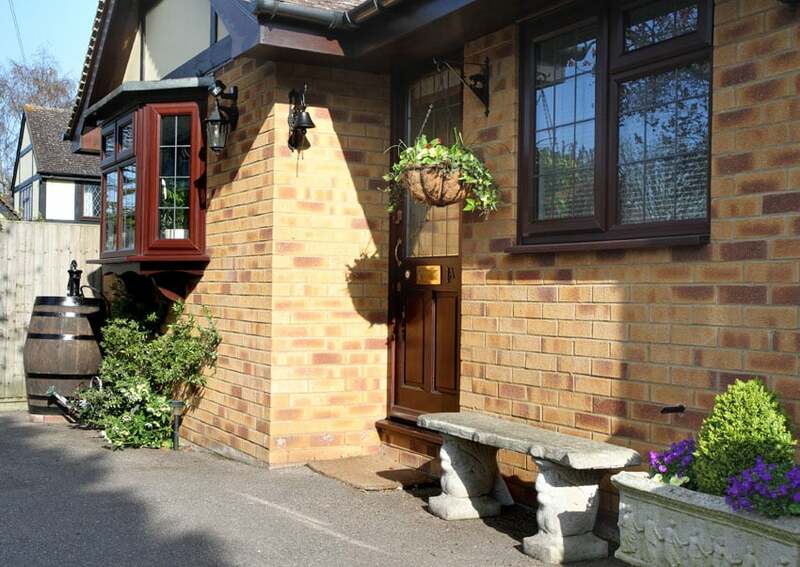 In choosing what outside bench is best for your home, it is good to consider a wide range of materials. Then match that material’s physical characteristics and aesthetic value to what type of garden you have, where in the garden you would like to place the seat, and how you’d actually like to relax when you’re in your garden. 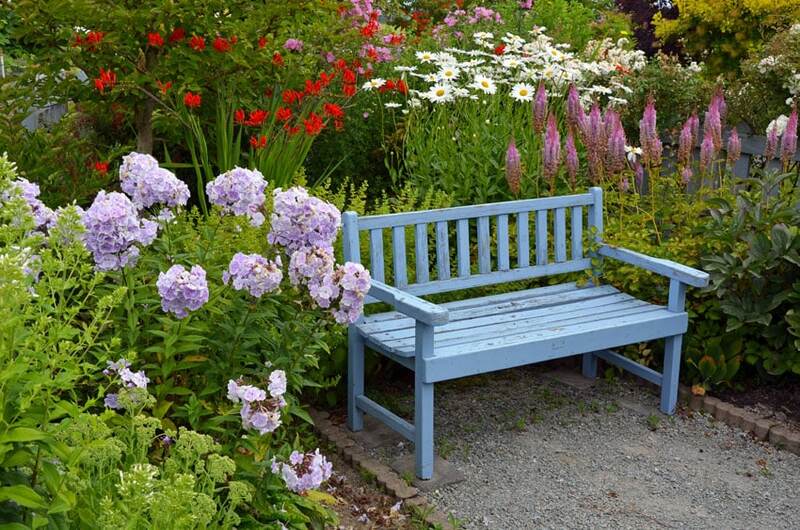 Here are a few common types of outdoor bench ideas that can suit most garden types. Built-in – this type of outdoor seating is perfect if you are expecting to host a large number of people in your outdoor space. With the ability to be fully integrated with plant boxes and fire pits, these are a great way of organizing large outdoor spaces and maximizing views of the garden and landscape. Circular orientations are a great way of creating more social dynamics, while creating a linear type of built-in seating promotes more movement and a larger central space. Usually done with a cement base, the seats can also be made of polished cement, or it can also be made of wood or tile. 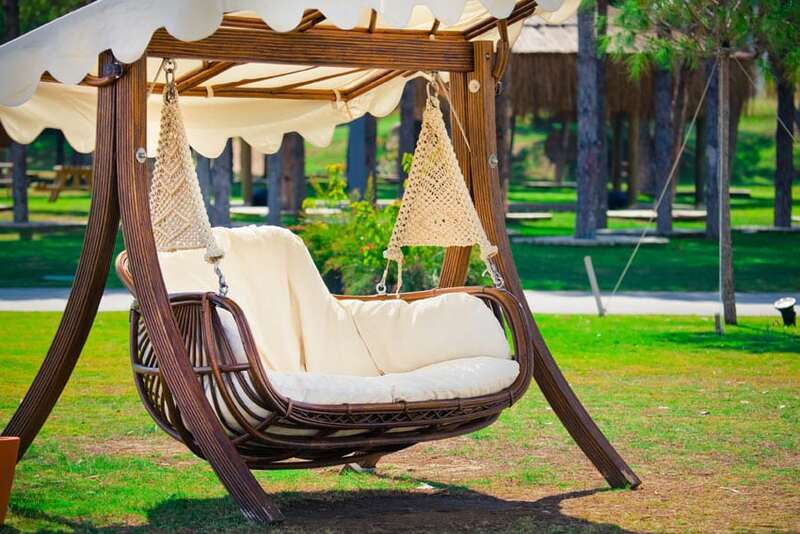 Hanging – perfect for just 1-2 people, this is the most entertaining type of outdoor seating, hanging from an overhead canopy, balcony, or maybe even a large shade tree. 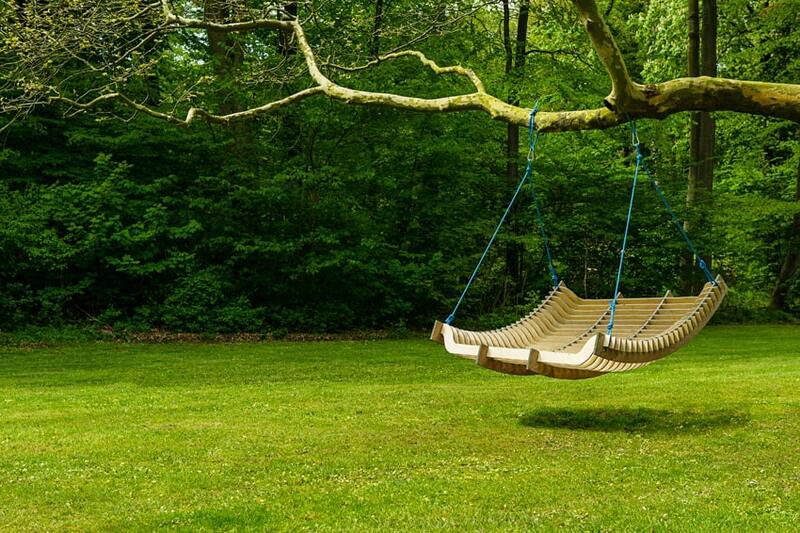 This is best placed oriented towards the best view in the garden, so as to enjoy gentle swinging movements while admiring the scenery. Bench with roof – although gardens were made to enjoy the outdoors, sometimes, nature does get in the way when it decides to throw strong rain, harsh sun and heavy snow on your garden. 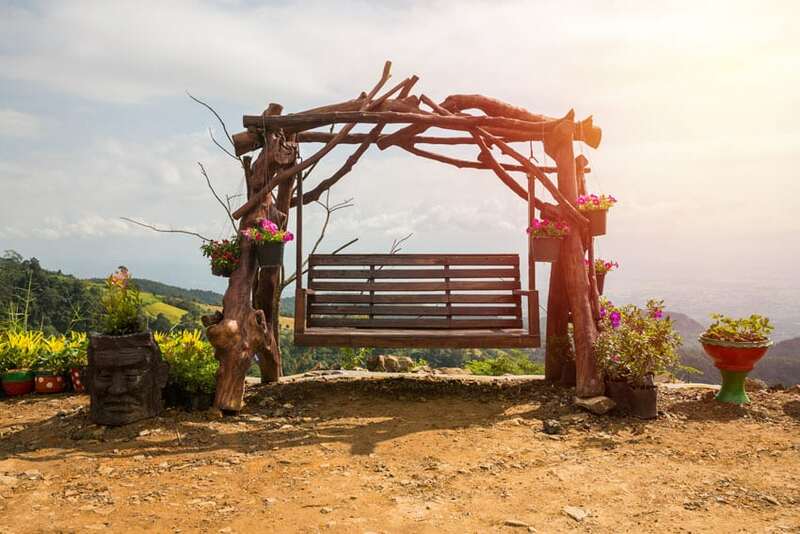 To keep safe, a bench can be fully integrated with a roofed structure, be it a small gable roof, or just a trellis with beautiful vines creeping through. Of course, it is always best to match the material and color of the roofing to the natural setting of the landscape, as well as to not block out too much light, air and view with its covering. Picnic bench – the most practical choice for outdoor seating, a picnic bench is the most flexible choice for multi-use gardens, as it can be used for a variety of activities and can host a good number of people. Whether you’re just using the picnic table and bench combo for just afternoon tea or a full-on barbecue day, the picnic bench can accommodate it all. 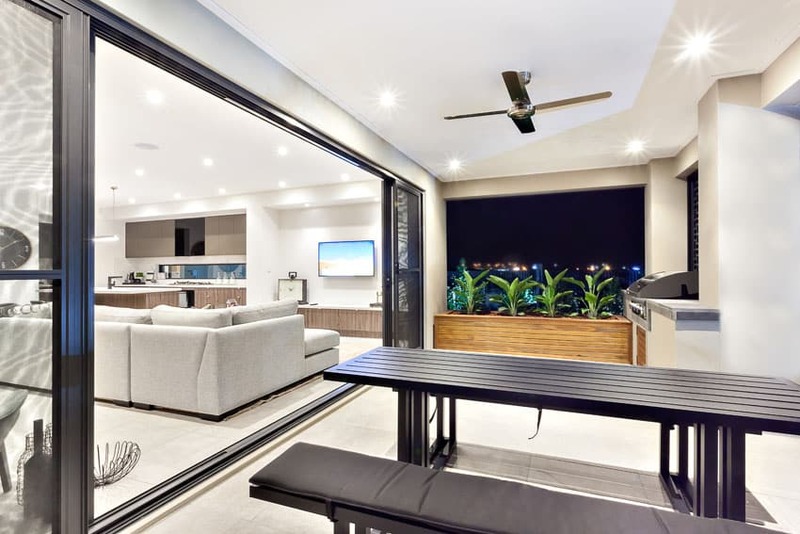 This flexibility also allows the patio space to be used for more everyday functions that would otherwise be confined to the house’s interiors, such as studying, eating, working and entertaining guests and visitors. After all, a little sunlight and a breath of fresh air mean the difference between a cold, drab day and a natural burst of energy from the outdoors. 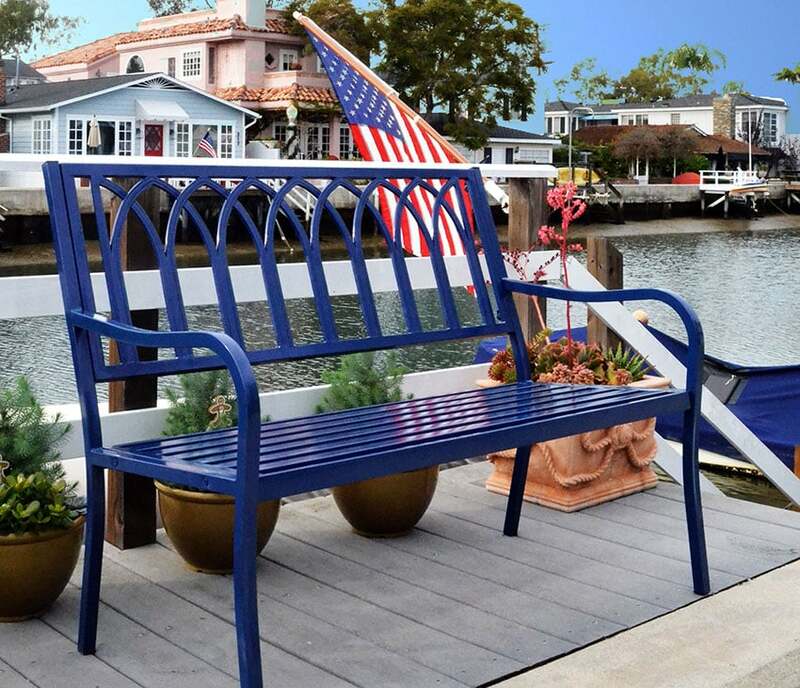 Straight-backed bench – the most common type of outdoor seating, these can be store-bought in a wide range of varying budgets, designs and finishes. This is also a pretty common option for DIY-ers, because of its simple yet highly functional profile. Backless bench – the simplest kind of outdoor seating, this type of seat is perfect for larger outdoor spaces where the seat will be used for temporary resting space, and not as a long-term seating option. It is also good for areas where the bench doesn’t interrupt any important landscape elements, as it can be designed low and unassuming. This modern house’s backyard patio, done in washed limestone, sits beautifully with the dessert landscape. A fire pit, centered in between three raised benches, provides warmth during the cold night, while a pool in the background is a welcome respite during the day. The seating area is surrounded by landscaping and a rough rubble retaining wall encircling it. 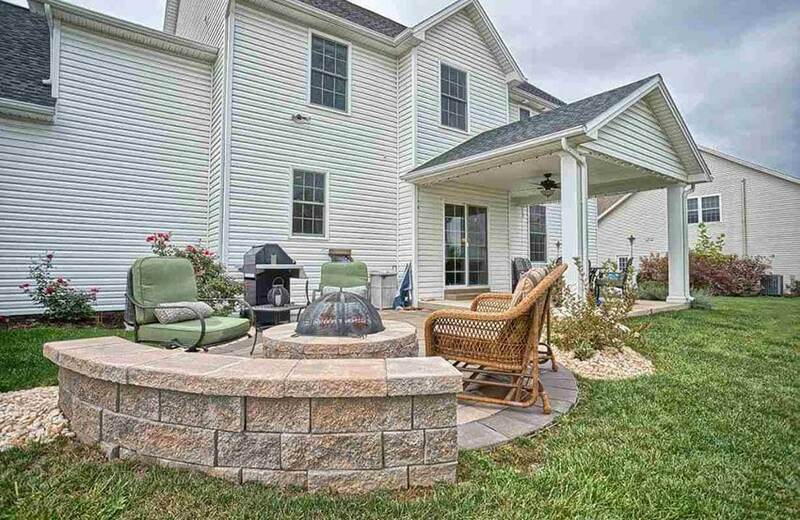 This traditional double-roof house features a large patio, starting with a wooden pergola over an outdoor dining set on one end, and a lovely built-up stone fire pit and curved stone bench on the other. 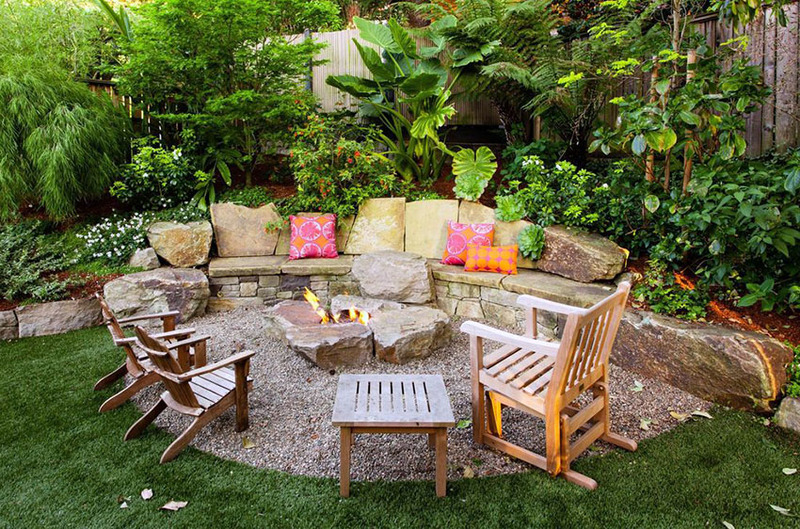 Built up of porous beige rubble rock, the seating area gives the traditional outdoor space a more rustic vibe. This large suburban style home sets itself apart from the rest by adding a backyard fire pit attached to the house’s backyard al fresco. Made up of blocks of reddish stone, the fire pit bears a strong yet subtle contrast to the house’s white wooden clap boards, but is toned down by using mismatched kitschy outdoor furniture and cushions. 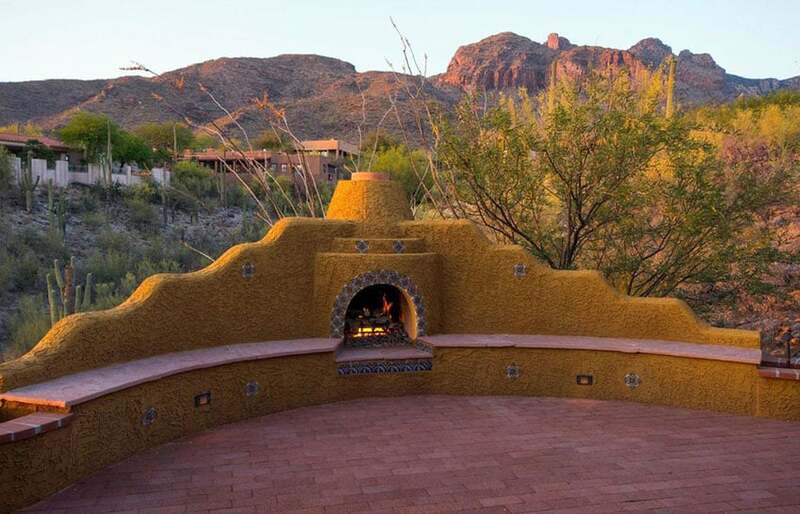 Set in the warm red hills of the desert, this Mexican style patio features a highly textured vibrant yellow finish on its stepped concrete bench seating. This stark finish is toned down by using pale reddish brick for the seat and decorative pattern tiles around the central fire pit and all along the back wall. 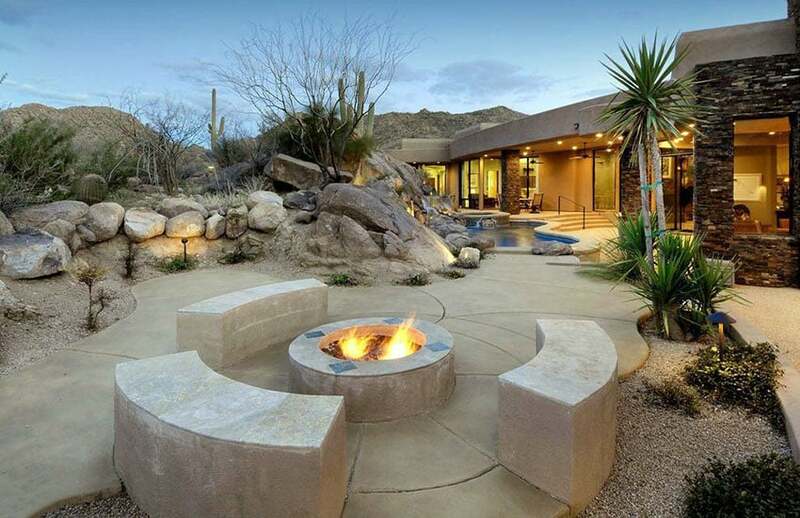 The fire pit area culminates in a cylindrical top, creating a sort of emphasized peak. 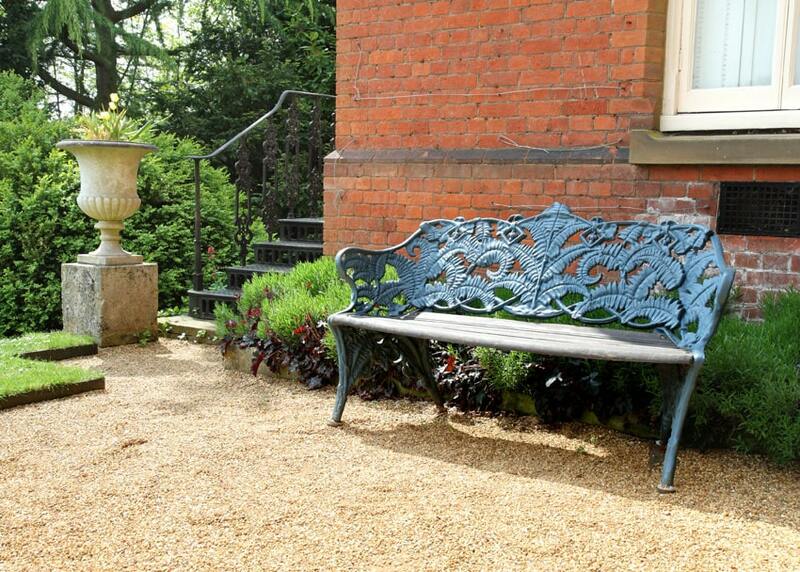 Although simple, this beautiful metal bench features scroll and vine designs on its back, adding a touch of elegance to any garden. 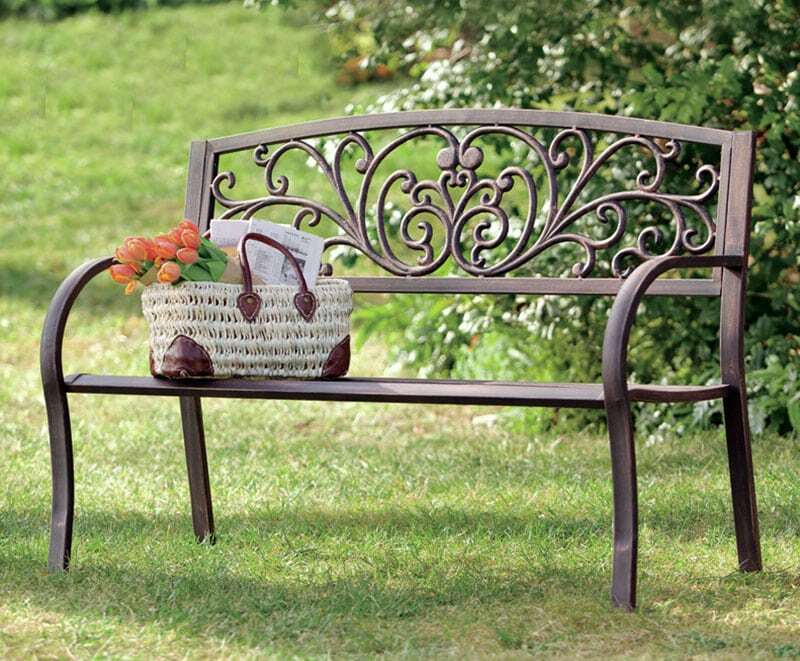 This bench should last a lifetime, thanks to its durable iron body and timeless appeal. 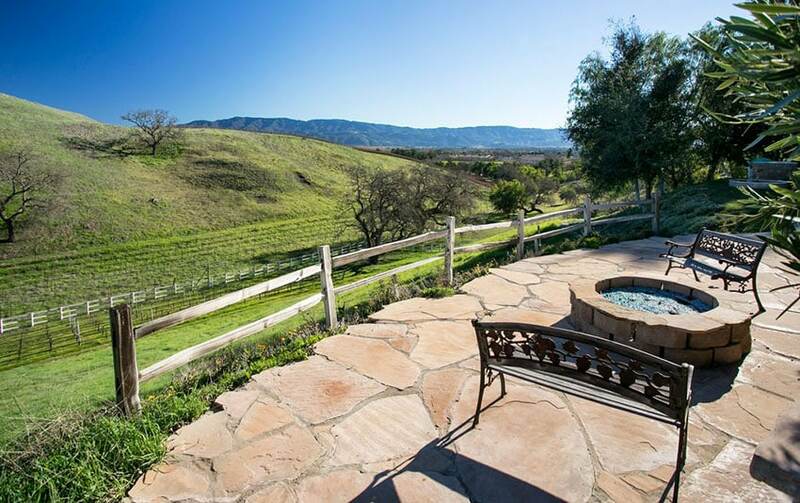 This beautiful flagstone patio looks over a vast green ranch and is set apart via a rustic barn style double rung horse fence. 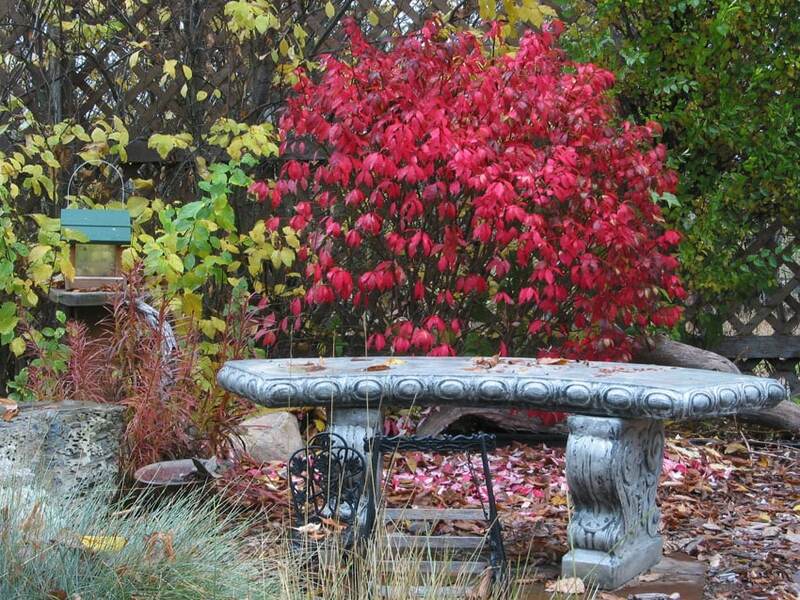 A pair of antique wrought iron benches are placed on the patio and surround a low fire pit built up of a reddish stone brick. For maximizing views choosing outdoor bench ideas that are portable can provide you with versatility while watching a sunrise or a sunset. 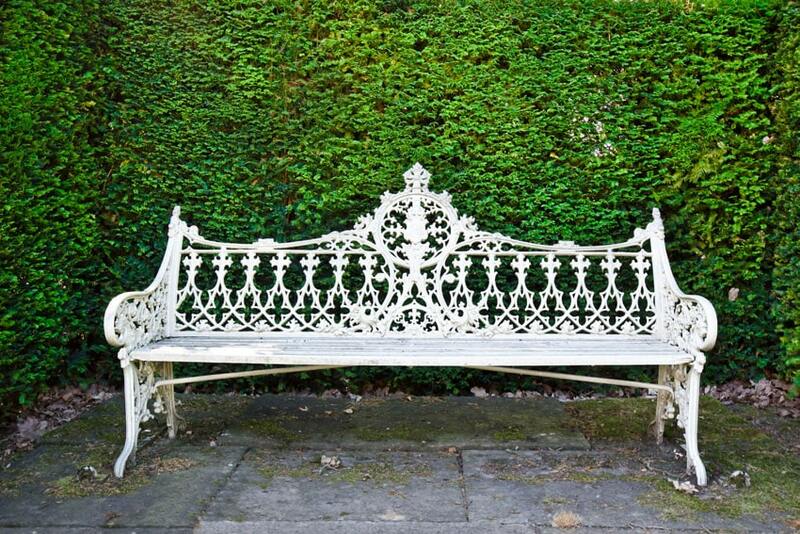 This traditional style white painted wrought iron bench sits regally in front of a high garden wall. Its white frame contrasts well with the lush greenery behind it, and the intricate pattern brings a touch of class to an otherwise regular garden. 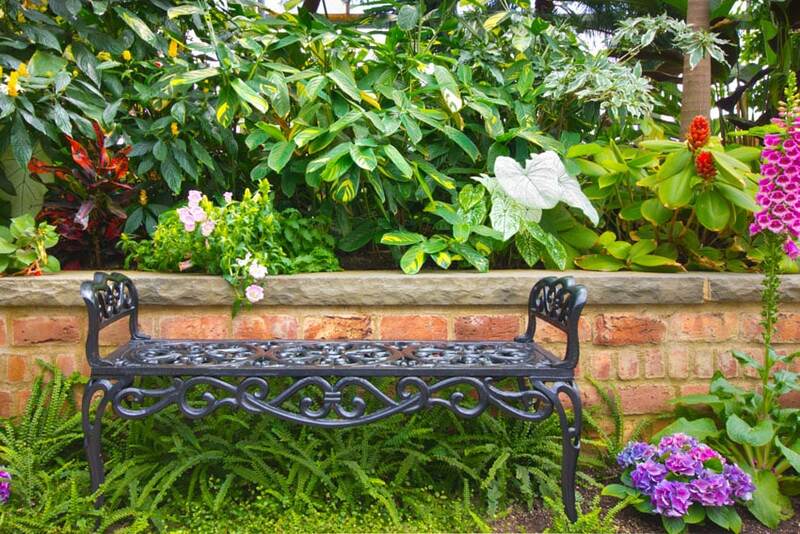 This backless metal bench features black wrought iron done in vintage scrolls and motifs, sitting in front of a low red brick garden wall. All around, large leafy plants tower, along with splashes of color from seasonal blooms. The bench nestles into the landscape very subtly yet evokes a certain nostalgic sense thanks to its classical profile. 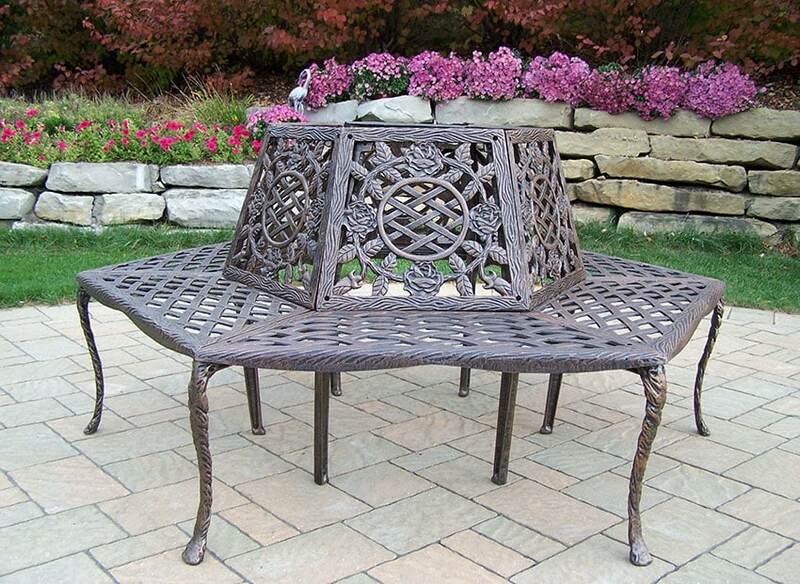 This hexagonal bench features a rust free cast aluminum body finished in antique bronze. With the capacity to carry around 750 pounds, this bench is perfect for larger outdoor social spaces. In this case, the leaf and lattice motif bench is placed at the center of an ashlar tile floored patio. This old bench, repainted aqua blue and then rescrubbed to give it a vintage look gives this back garden a retro-modern touch. Sitting at the end of a gravel path and surrounded by lush shrubs and blooms, the pale blue is a great match to the variety of colors present among the flowers. Sitting on a grey flagstone patio, this long brown wooden outdoor bench features a traditional profile with its straight wood slatted back and seat set inside arched arm rests. Sitting on this bench, one enjoys being in the foreground of tall flowering shrubs in clean white and vibrant red. This simple shiplapped cottage in blue paint and white trim is the perfect home to the warm wood tone of this backyard’s unique seating arrangement. Done in an L-shape, the outdoor bench is combined with wooden planters done up in planks, placed on the pebble-paved side of the lawn closer to the house. This simple wooden bench features a curved S-profile in black iron decked with standard size timber poles running along its front. Set in front of a semi-paved foot path, this bench is low and allows people seated to feel the grass with their hands while seated in this lush garden. 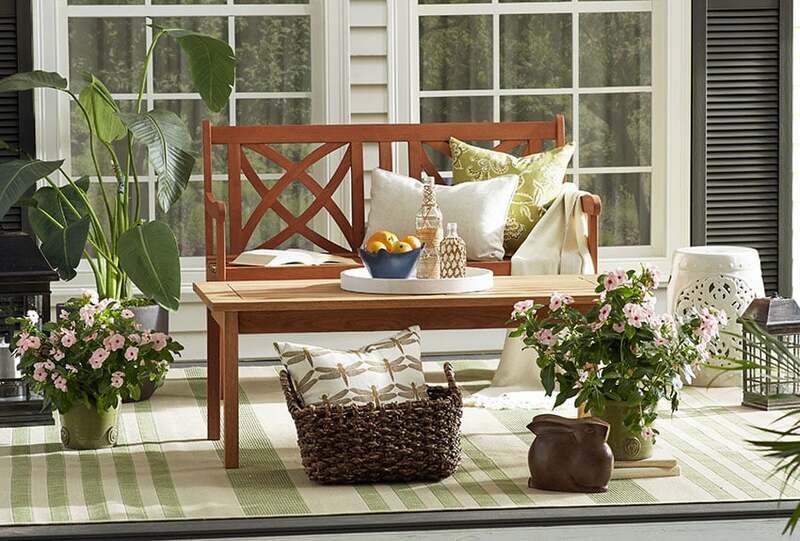 Make the most out of smaller patio spaces by choosing a bench that doesn’t “feel” small. This simple bench made out of eucalyptus features a lovely curved lattice pattern on its back and feels right at home when set on top of a crisp white and green rug and surrounded by plants. Mimicking the corner shape of the row of garden planters behind it, this hanging bench comes in an L-shape and is made of a warm cedar wood finish. Pale white and blue throw pillows are added on top and go well with the vibrant purple of the flowers, as well as the deep greens of the ivy-covered wall. 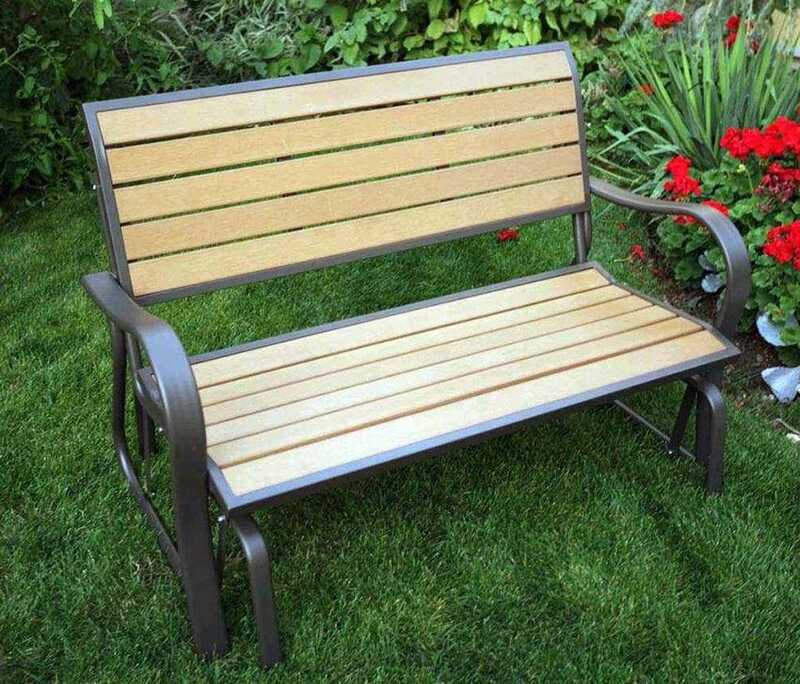 When creating your own outdoor DIY seating its important to know the best wood to use for outdoor benches. 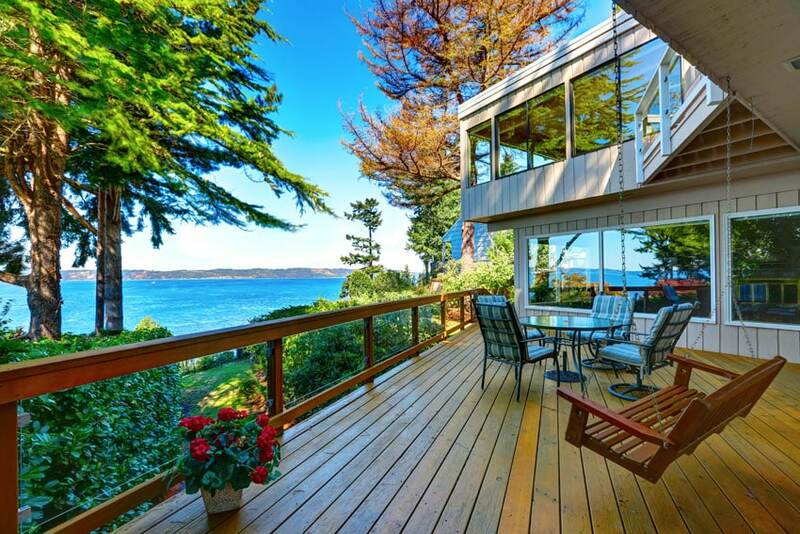 Using the right type of wood will help prevent damage from the sun and moisture. Here’s some of the best natural wood materials for creating a outdoor bench: Acacia, Redwood, Cedar, Cypress, Teak and Shorea. This modern style house features an all-paved backyard, utilizing large slabs of concrete partitioned neatly by grey river pebbles. Aside from the woven plastic outdoor furniture and stainless steel grill, an L-shaped bench runs around the outer edge of the outdoor space and is made up of reclaimed wood seating mounted onto a scrubbed concrete backing, going with the industrial feel of the main house. This Contemporary style backyard features a thin cut, dark stained reclaimed wood plank being used for its walls and raised patio flooring. It’s also used for the U-shaped bench and raised fire pit culminating in white tile. The seat of the U-shaped bench is decorated in a deep blue color, contrasting with the dark brown wood finish and the lush green hedges all around. This contemporary style outdoor space features a minimalist DIY bench hanging on the back wall’s rough concrete finish. With its simple design, throw pillows in bright shades of blue and orange were added, as was a zigzag pattern tapestry to the back. To it side, hanging air plants and decorative plants breathe life into the space. 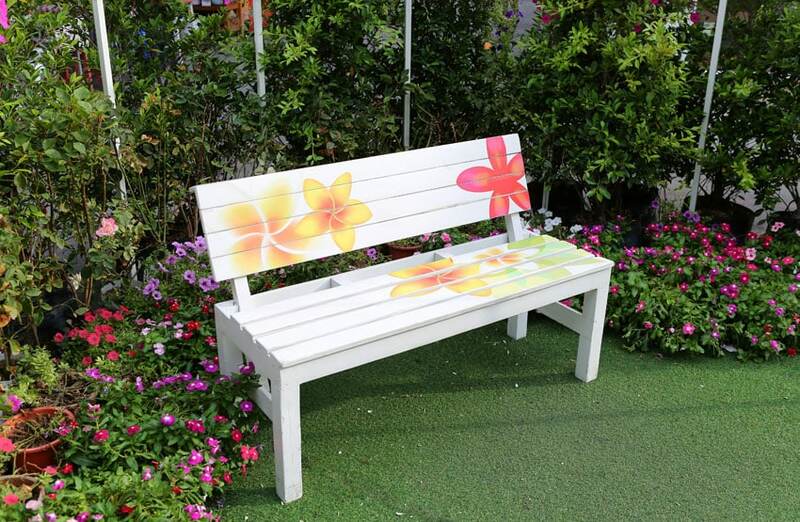 Perfect for family DIY activities, a regular old garden bench can easily be spruced up by painting on some fresh patterns. Spray painting on a stencil is one of the easiest and least messy ways of achieving this look. When returned to its location, the newly painted bench brings out the color of the low flower bushes even better. 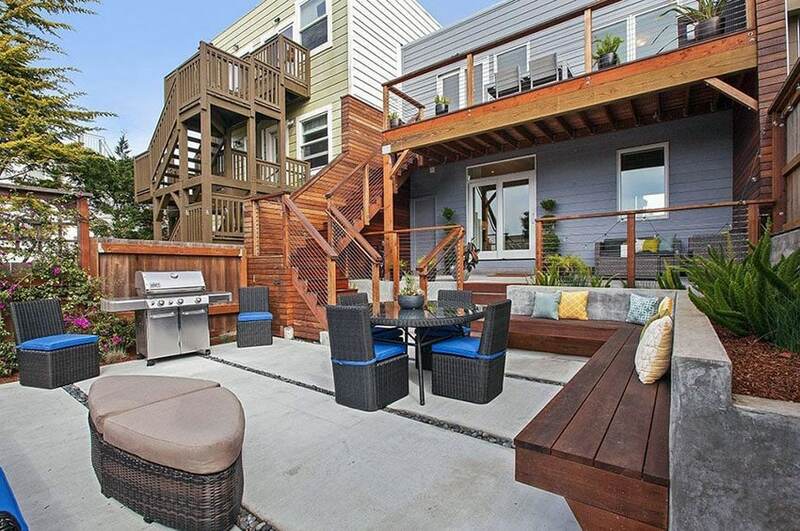 This all wood double decker backyard patio features a linear staircase coming from the top floor balcony down to an expansive wooden deck surrounded by a canal of wood shavings and then a grass area. The lower deck, elevated from the ground, features a pair of simple yet functional wooden benches of the same wood species as the entire deck, easily blending in, as they are bolted directly onto the deck, making them safe and sturdy for outdoor use. 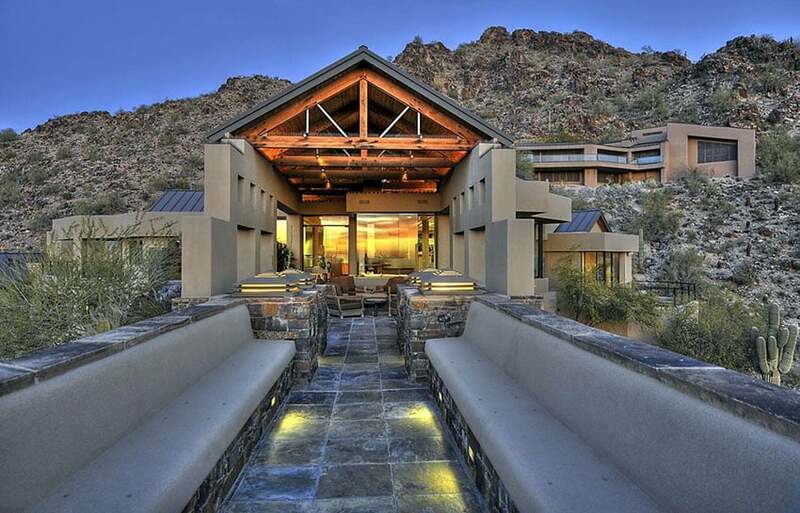 This huge mountain side mansion features strong cement and reclaimed wood finishes in its walls and roofing. A line of concrete benches on either side of the entrance are the perfect seat when admiring the view and blends very naturally with the house and surrounding cliffs. Square cut stone tiles also pave the way towards the entrance and are lit by small lights embedded below the benches. 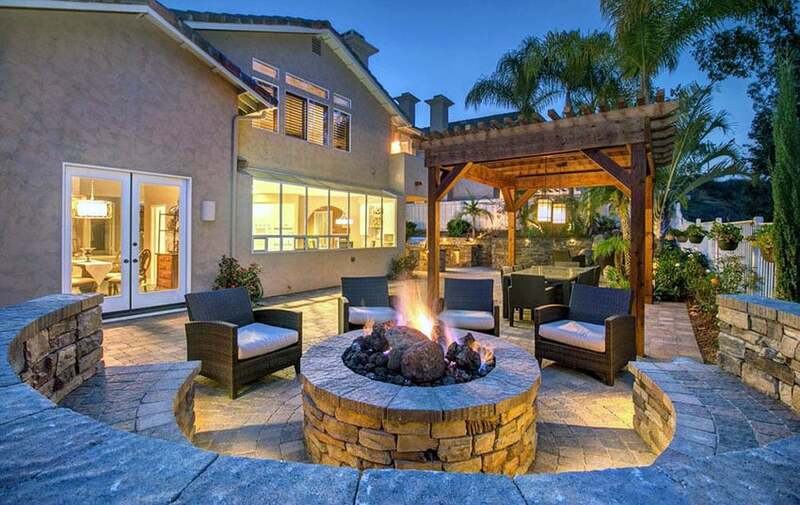 A modern-style patio in sharp square angles features a raised square fire pit and recessed seating all around it. 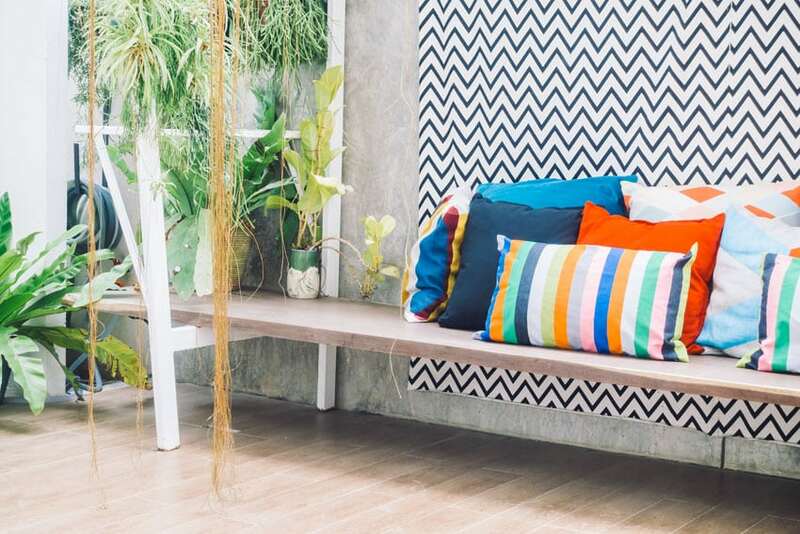 The L-shaped concrete corner bench is decorated with a moss green cushion and a psychedelic pattern for its backrest, a vibrant contrast to the pale grey stone used for the rest of the patio. 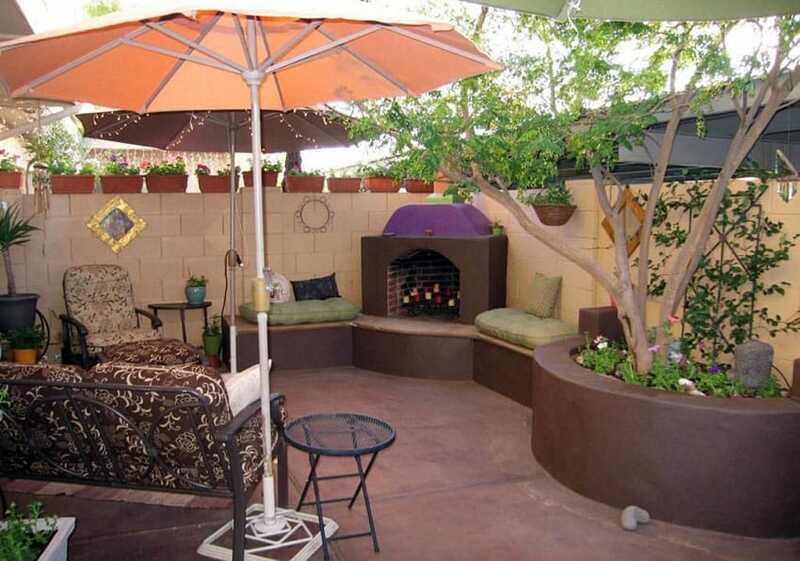 This South Western style patio features a planter, low outdoor corner bench and fire place done in a smoothed concrete running along the beige block perimeter wall. Done in a beautiful chocolate brown, the cement finish ties together the vibrant purple mantle, the red brick of the fireplace and the traditional brown cushions on the outdoor furniture. All around the perimeter wall, rectangular plant boxes provide a simple yet beautiful decorative element. 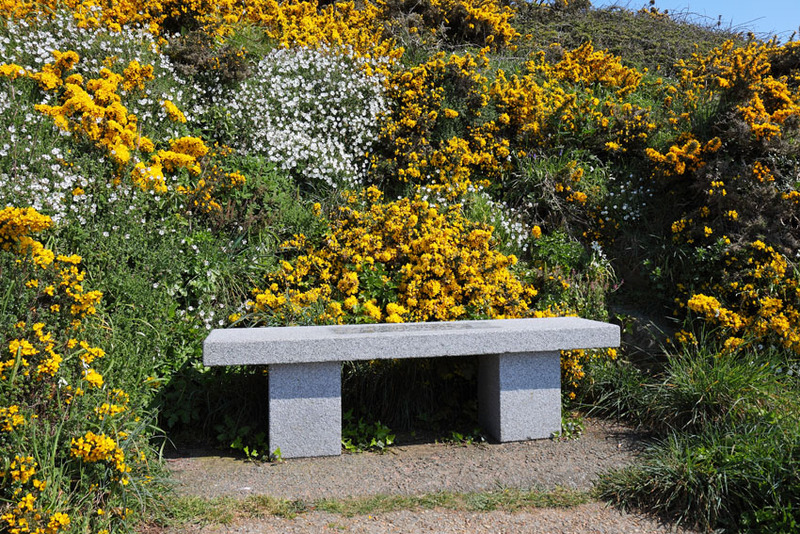 This low stone bench, with its textured pale grey finish, is the perfect addition to this overgrowth of yellow flowering bushes. The area is led to by tall grass and stamped earth, a simple design element to a wild, untamed outdoor area. 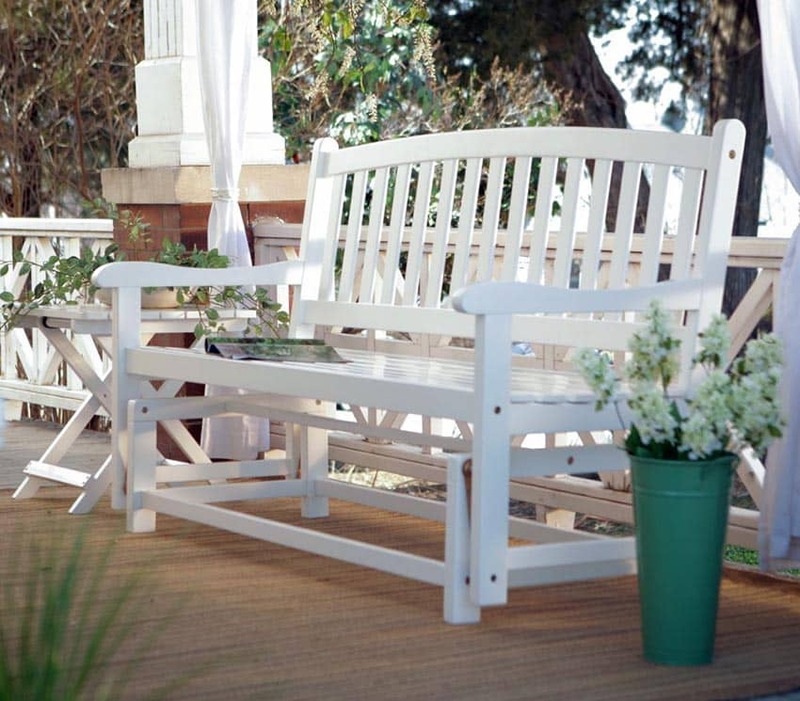 An outdoor glider bench is a great furniture piece for your garden. The smooth gliding motion of the bench makes it a relaxing spot to enjoy a cup of morning coffee or kick back at the end of a long work day. A swinging Adirondack bench creates a more dynamic element whilst still matching the style of the two low-seated wooden lawn chairs. With the seats in a warm red wood finish, it contrasts well with the bright green grass and the simple grey stamped concrete of the patio floor. This beautiful lake house features a long deck on its side, facing away from large picture windows trimmed in white framing. The wooden deck, done in a faded yellow wood plank finish, contrasts with the large timber balcony and cushioned outdoor patio set. To one side, a modest swing bench is hung from the top floor and promises spectacular views while swinging. 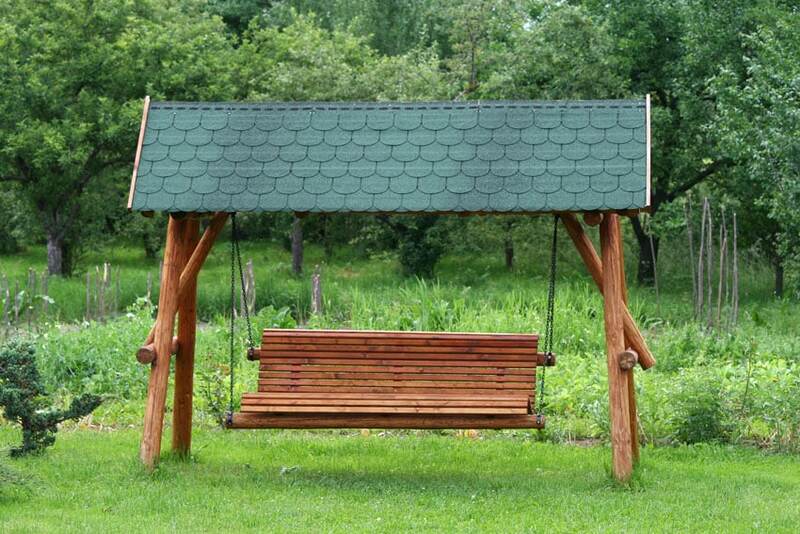 This overgrown backyard features this wooden swing bench setup as its main decorative element, with its rounded log construction and wooden slat bench hanging from the top. The green slate gable roof also becomes the space’s defining aesthetic characteristic, while providing ample shade during rain or shine. Strong and wide enough to seat two, you can spend whole afternoons just lazing around the outdoor patio with this lovely hanging loveseat. The base, done up in larger wood timbers and secured by metal screws tastefully curve from the ground up and hold up a textile canopy over a wooden frame. Below it, the white cushioned swing seat is held up on both ends by a strong woven fabric, that make it both touch and aesthetically pleasing. Dangling inches above the red polished concrete floor, this white painted wood bench with cylindrical motif on its back and arm rest is attached to the ceiling via rope. 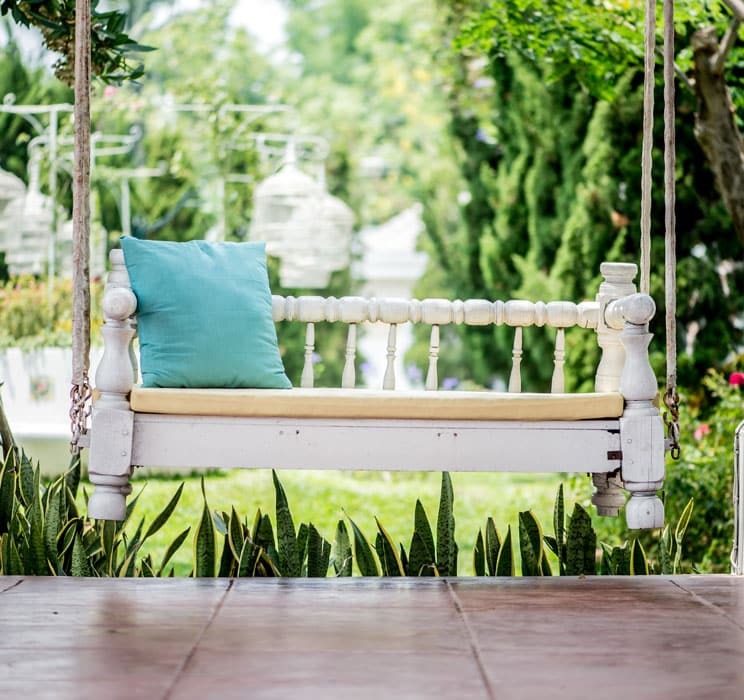 While swinging with the big beautiful garden in the background, the bench provides comfort via its canary yellow seat cushion and sea blue throw pillow. 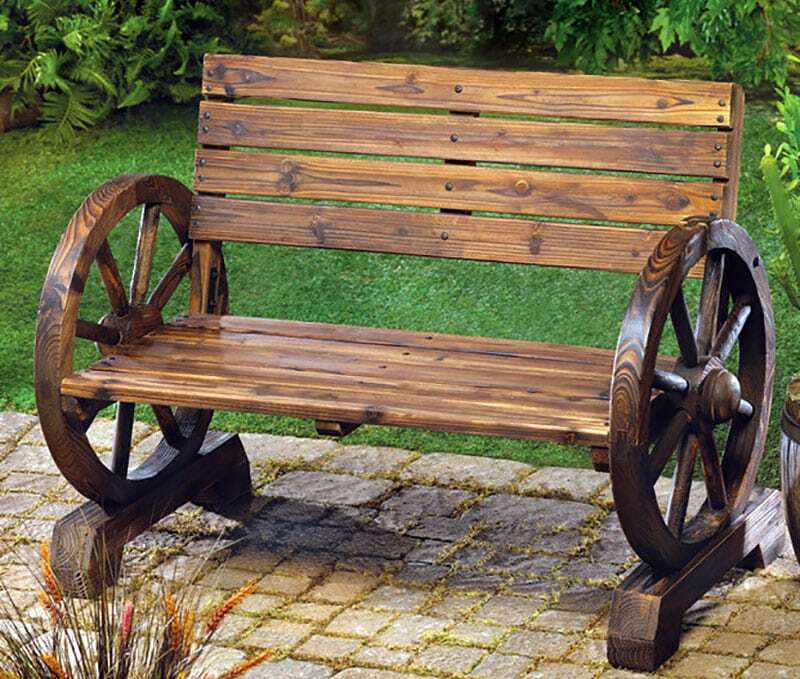 This very rustic looking swinging bench set overlooking a hill comes in a very unique driftwood assembly. Decorated with hanging flower pots and even an old Olmec head used as a plant pot, this outdoor seating area exudes a quaint yet vintage charm. Almost sculptural in its appearance, this hanging wood bench is made up of several horizontal slats of a yellowish wood type that looks almost like it came from the tree it is hung up on. The electric blue rope on which the bench is hung on is a great contrast to the pale wood finish of the swing bench and the greens of the freshly mowed lawn. 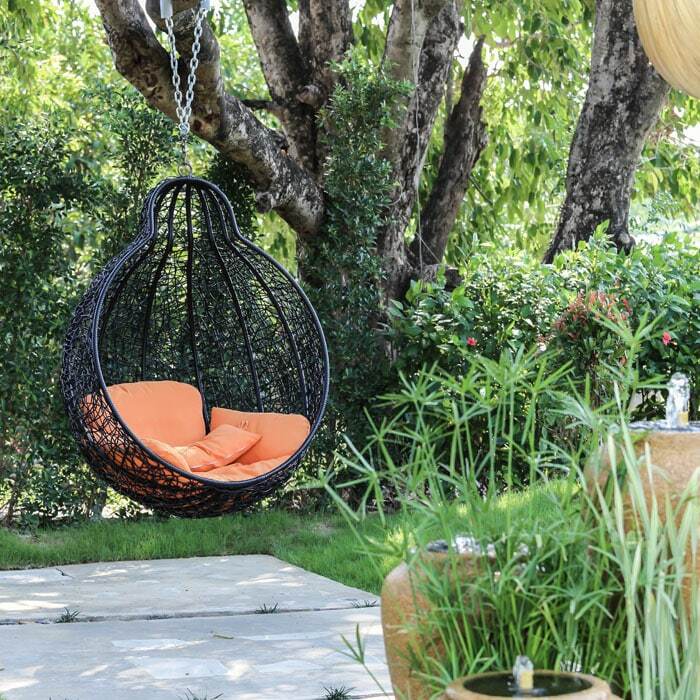 Hanging on a sturdy metal chain, this hanging swing chair is a very comfortable addition to any back garden with its rounded profile and wicker construction. Made even more comfortable with seating cushions, the bright orange upholstery is a good accent to the dark wicker threads in abstract patterns as well as the plain white cement patio. 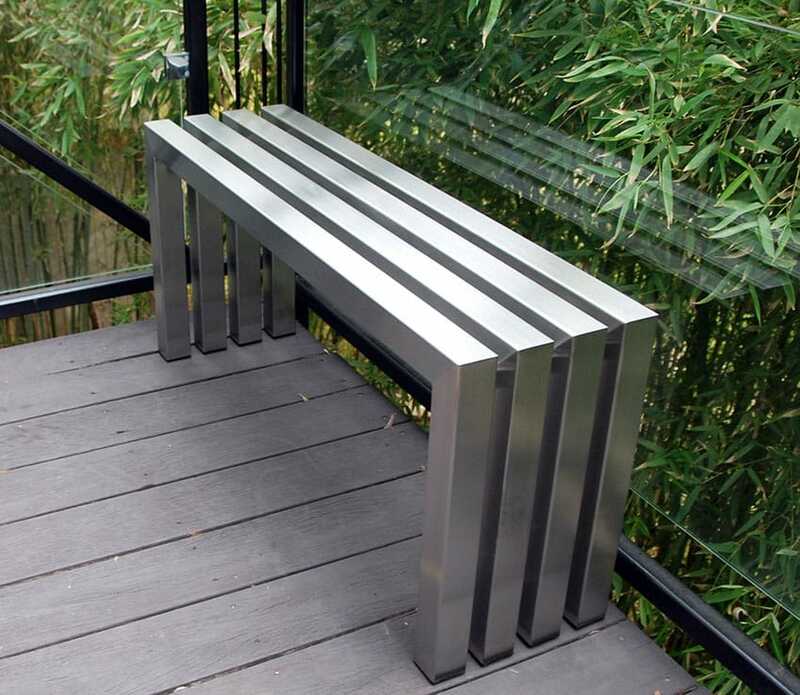 This 100% stainless steel patio bench, with its sleek chrome linear profile, matches well with a modern garden setup. 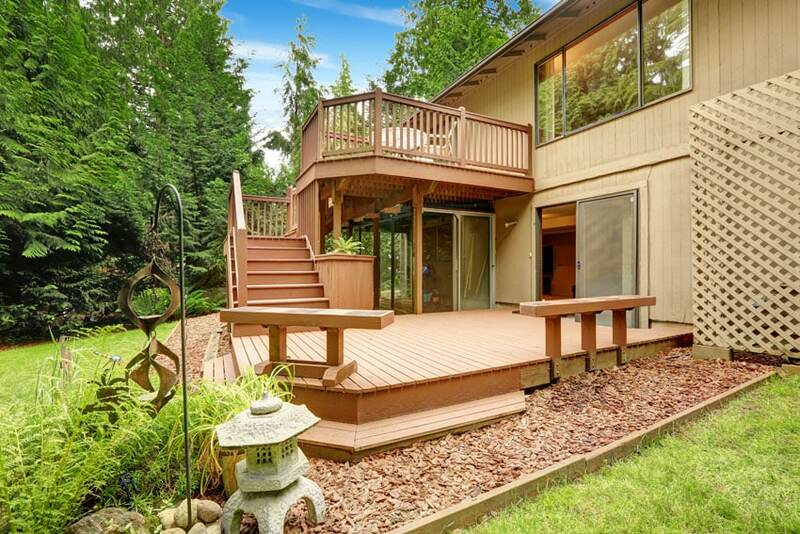 In this instance, it is pushed to the corner of a grey-tinged wooden deck with glass balcony. 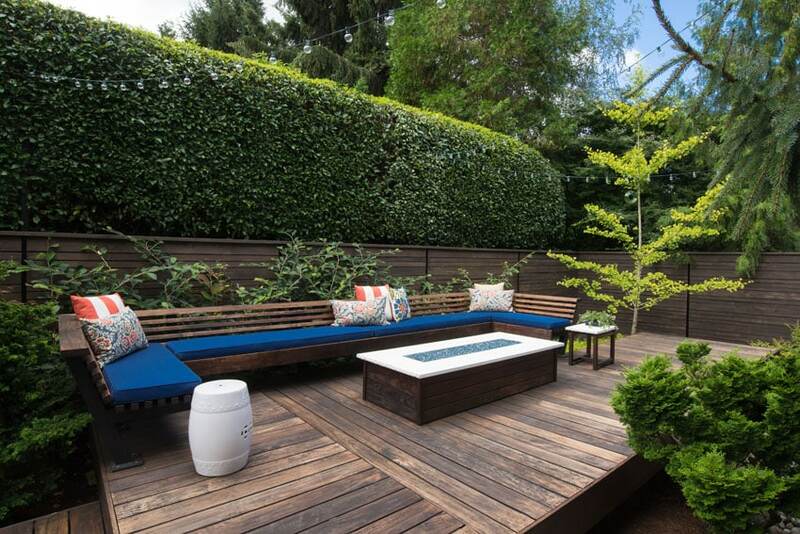 The greenery around it accentuates the deck’s modern theme via the use of bamboo. Conversely, this bench can also be used indoors, and can resist wear and tear as it comes as a fully welded piece. 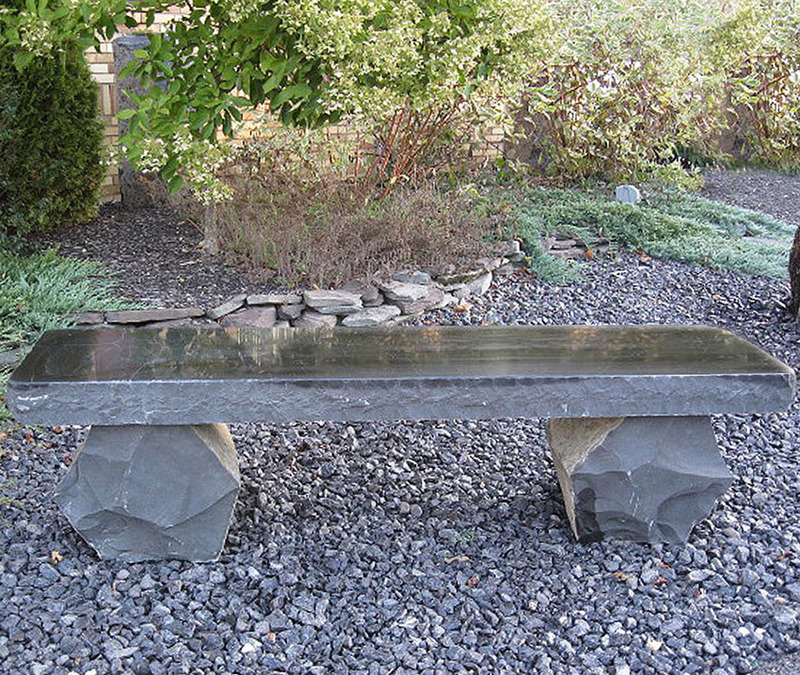 This highly structural piece is made of hewn basalt rock, a craftsman effort that resulted in a highly sculptural conversational piece and can liven up any old backyard garden space. Placed on a clearing of crushed gravel, the stone bench makes a bold statement among all the low-lying bushes and greens in the yard. The top of the bench is polished with a natural edge, creating a safe and comfortable seating surface. 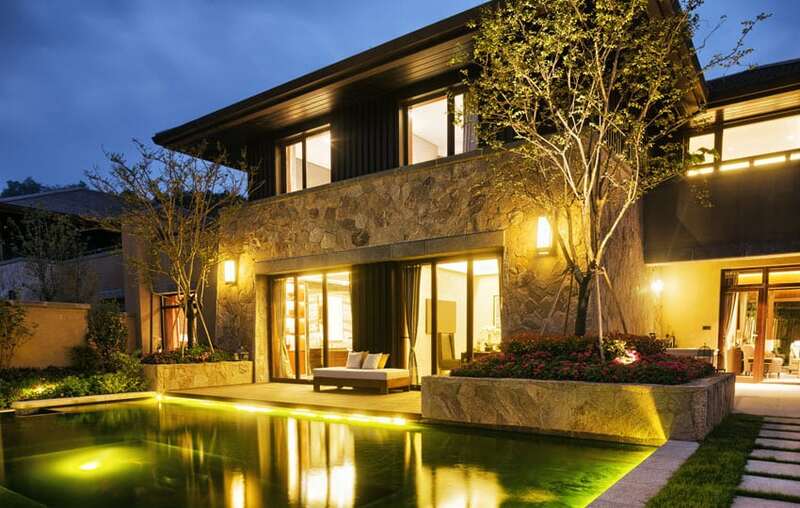 This luxurious pool, bordered by two large built-up plant boxes, is beautifully lit up at night and is accessed via a “floating” platform coming from the house’s living area. This underlit platform features just one piece of furniture – a luxurious rattan daybed with white cushions and throw pillows. A curved white rattan outdoor bench slyly sits by the welcoming poolside done up in a reclaimed wood strip flooring bordered by pebblewash cement. 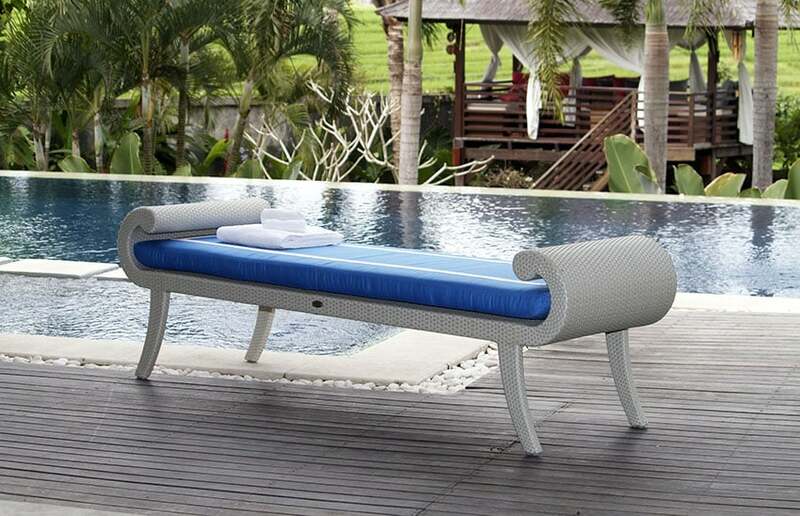 A peacock blue cushion is not only a great match to the pool’s deep blue but is also made of sunbrella fabric, allowing the bench set to resist weather and regular use. This rustic driftwood bench is of a very crude construction, yet possessed a certain craftsman’s charm to it, especially since it sits right on the beach. 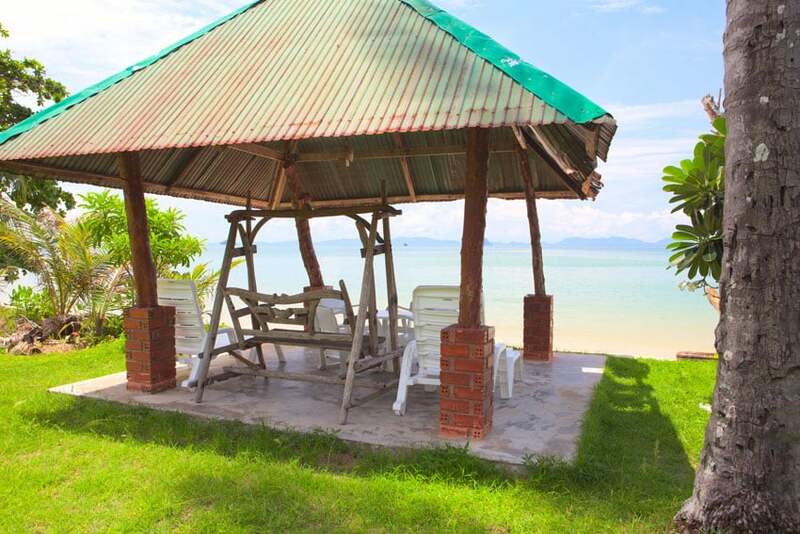 A palapa stands over the bench, which is an open space with a thatched palm leaf roof, perfect for entertaining wind during hot weather and for framing spectacular beach views. 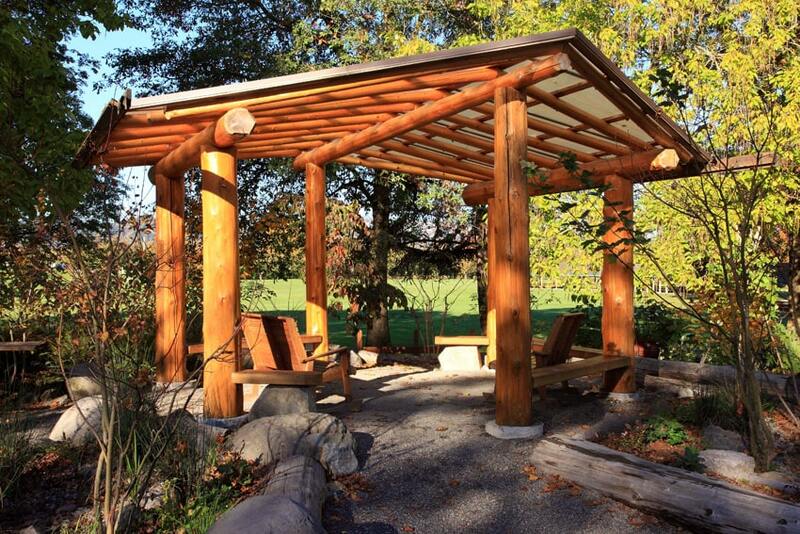 This craftsman style wooden backyard canopy features round logs on all sides in a warm wooden tone. In between these strong pillars are paler, more cubical wood planks that act as bench seating. 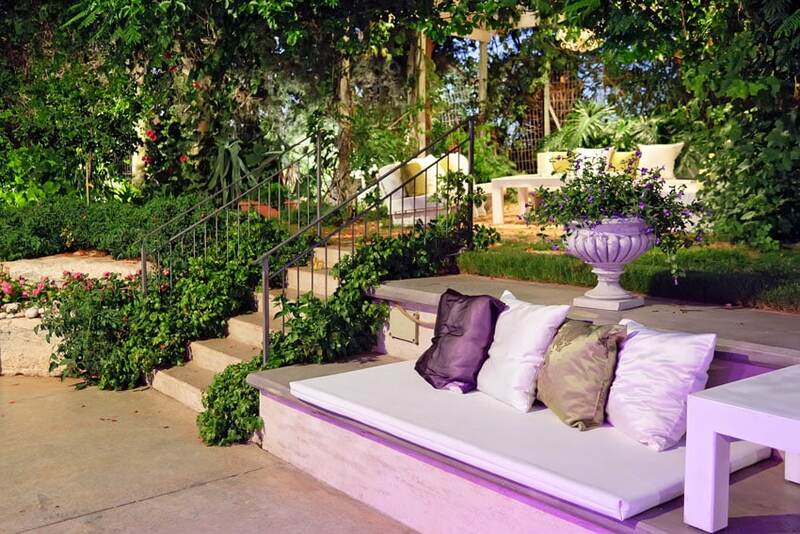 The outdoor space is decorated with outdoor wooden furniture and feature fine grain pebbles as ground cover. 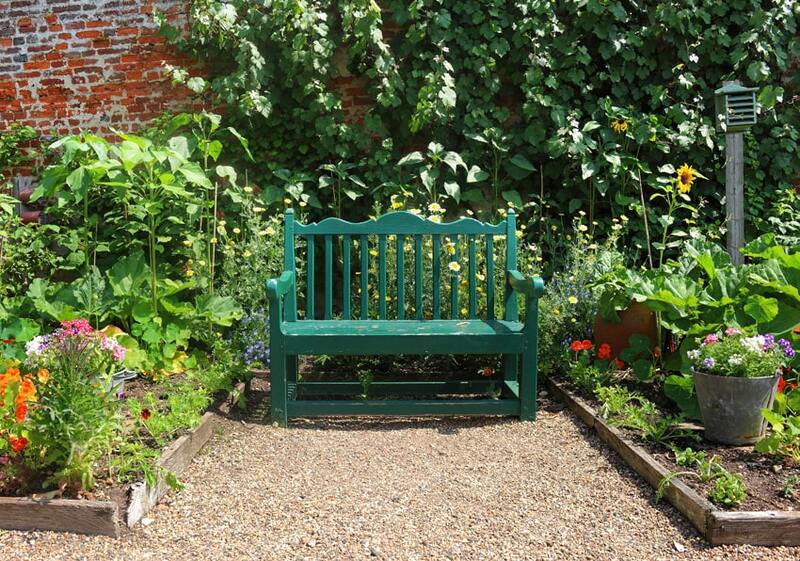 This garden bench features a blooming fern motif on its back rest and a simple wooden seat. This matches with the low greenery planted right behind it that also contrasts with the red brick walls of the house. The rest of the garden space features an orange pebble wash for its flooring. This small town cottage features a paved backyard, yet retains some garden elements thanks to its hanging planter and low under-sill bushes. A solitary stone garden bench is placed right in front of the red brick wall, adjacent to the ornate wood and gold plated back door. A similarly embossed white cement planter with human motifs sits right beside the bench and holds lively blooms. This basic square cement tile garden path is livened up by a heavy-grained wood bench. Featuring a pair of large spoked wagon wheels on each side, this classic profile also features wood slats on its seat and back. This is a great addition to give any regular old garden space a quirky vibe. 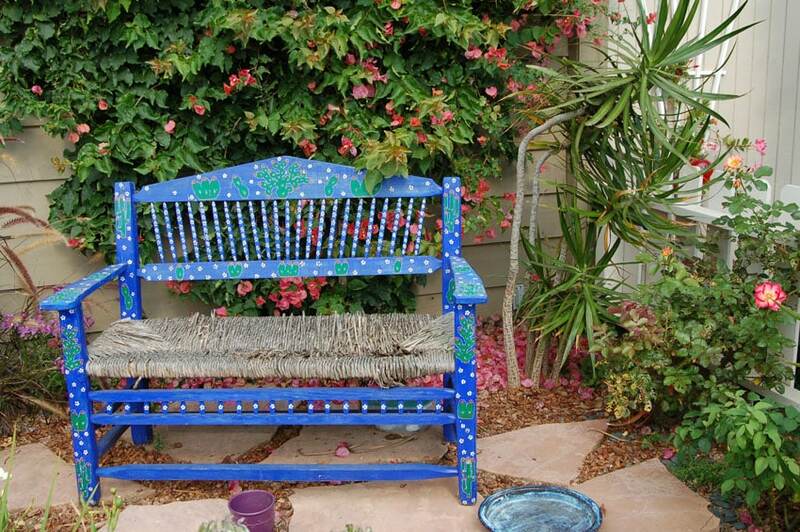 This old wood and wicker outdoor seating bench is livened up with a fresh coat of electric blue paint, as well as DIY floral and leaf motif designs on its surface. Placed on wide spaced cement flagstones inlaid with red pebbles, the blue wood bench really livens up the backyard space, especially sitting in front of a flowery vine creeping up the house’s exterior wall. 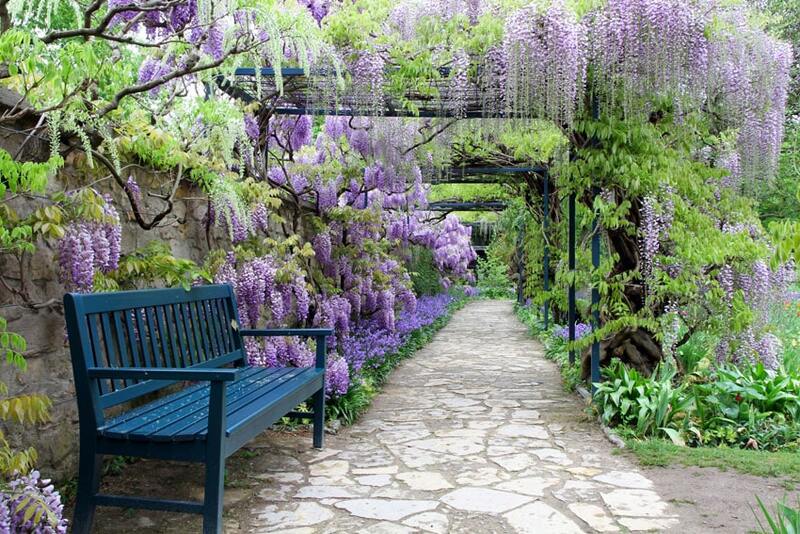 A wooden bench painted a deep shade of dark blue creates a beautiful play of color with the wispy pale purple wisteria blooming all along the length of this outdoor walkway. As if to emphasize the enchanting sight of the hanging blooms, large flagstones are laid out for the flooring and walls. 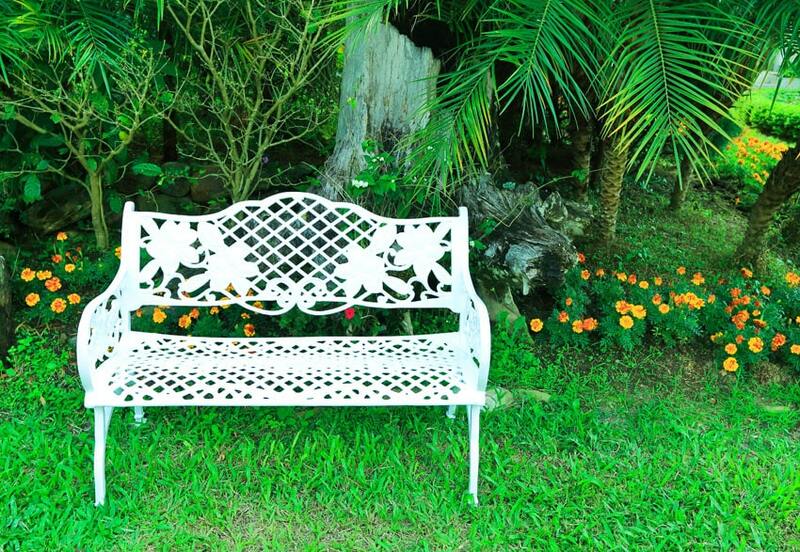 This tropical landscape, with its low blooms, carabao grass and palm trees, is a good backdrop to this traditional-looking white painted wrought iron bench. With a traditional basket weave seat and backing pattern, inlaid with flower and vine motif, the bench brings old school elegance to a fresh tropical garden. A red bush brings much needed life to a traditional curved concrete garden bench with egg motif edge and double scroll legs. Harking back to an ancient garden, overgrown grass and rustic outdoor furniture give this backyard an antiquarian feel. This bright flamingo pink bench done in a traditional profile is a welcome surprise to this small, traditional style backyard patio with red brick and cement flooring. The entire patio is surrounded on all sides by vertically oriented potted plants. Faded brick pavers are laid out to create a small patio space in this large lawn and garden. 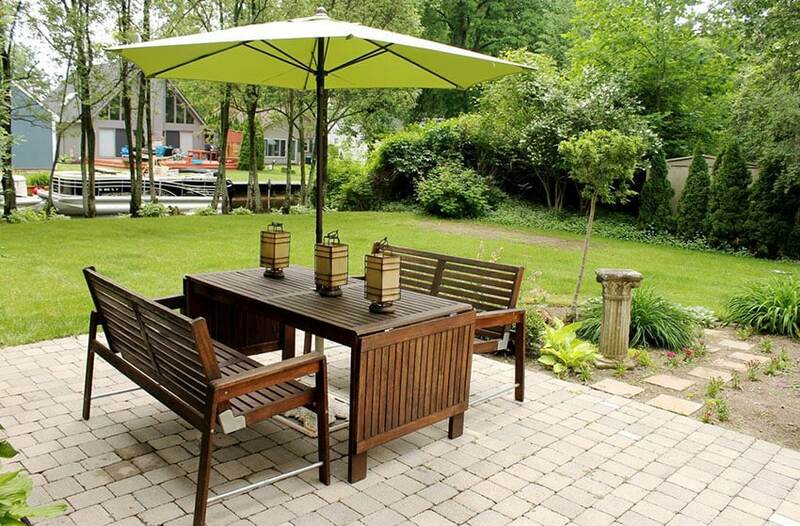 On the paver sits an outdoor dining table set made of a rich dark brown teak wood. The seat features two long bench seats around an extendable rectangular table. The entire table is protected from the sun through a lime green umbrella and is decorated with a trio of paper lanterns. 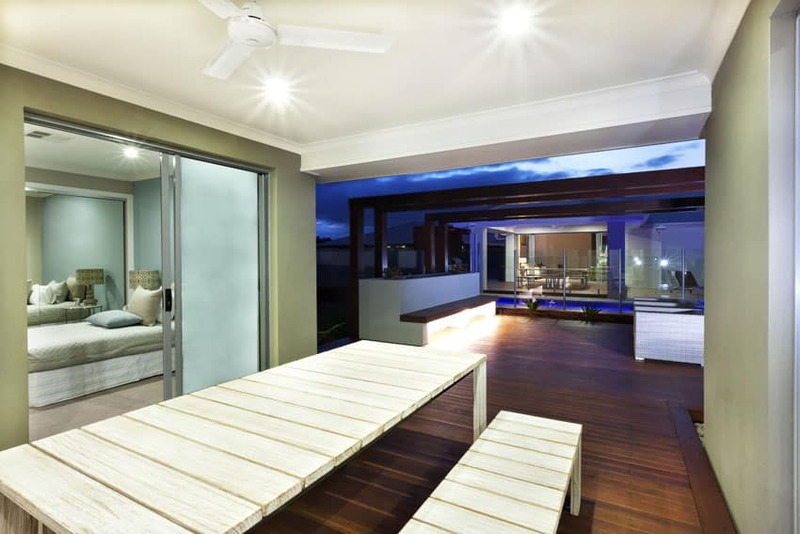 This super modern house features a long white outdoor dining set in white wood planks set vertically. This contrasts well with the dark wood plank flooring that runs all the way to the open area with pool, which also features a wooden bench set in white painted concrete and lit below its seat. 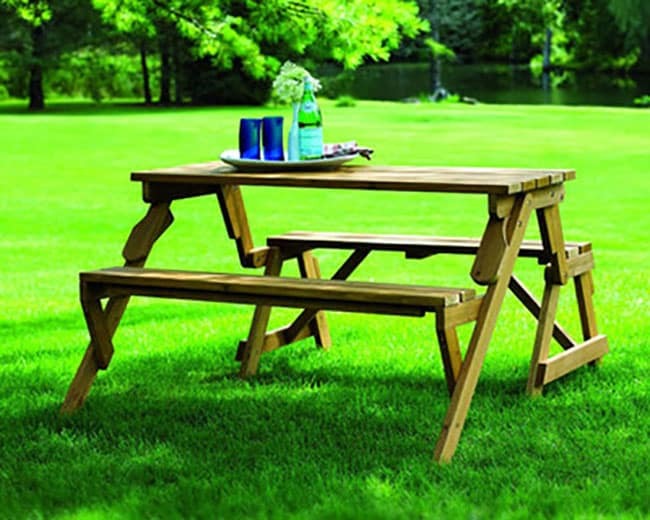 Although simple, this wood picnic table and bench set is a versatile addition to any outdoor space, transforming from table and bench set to large garden bench. Made of a mix of fir and hardwood, this wooden outdoor furniture is durable, can be painted, and features a smooth grommet for umbrella installation during intermittent weather. A foldable dark wood dining table set sits at the al fresco of a large contemporary style house. The bench seats are provided with a thin dark brown bench cushion and matches well with the off-white colors used in the rest of the house. 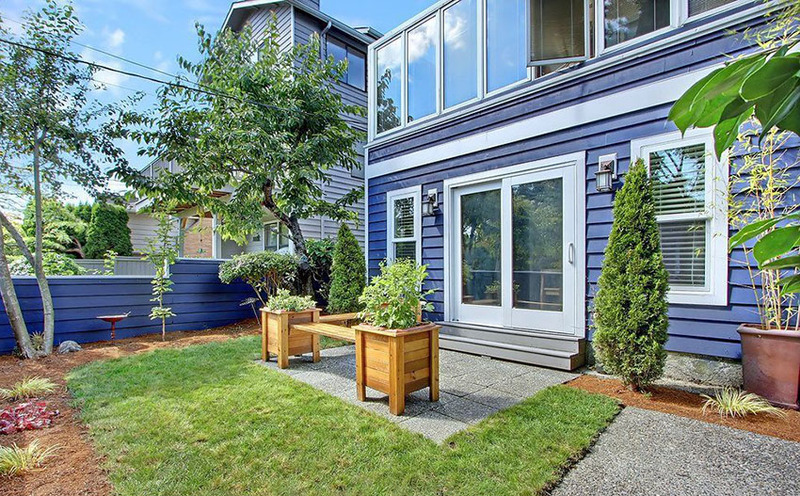 A warm wood planter box at the edge of the al fresco brings a touch of warmth to the space. 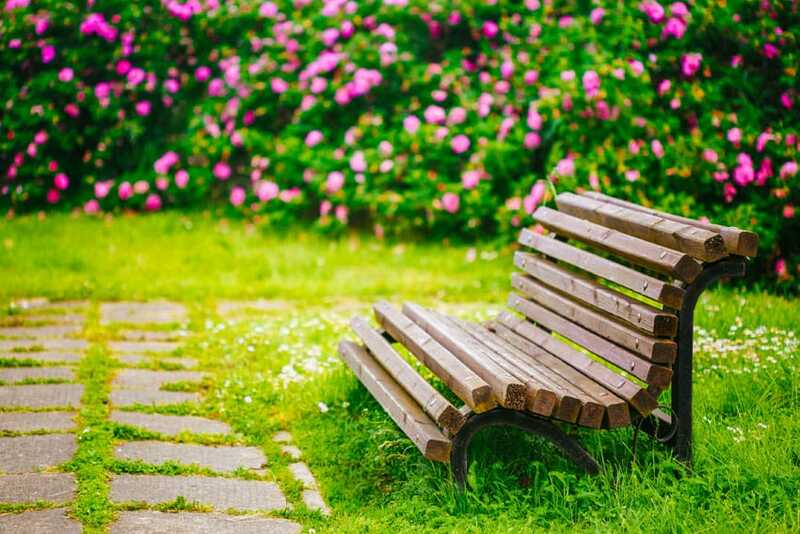 Set amidst bright patches of pink and orange blooms, and a backdrop of vibrant green shrubs, this long bench sits perfectly nestled within the nature all around it. Set on a cement slab, it comes in a weathered wood finish that further highlights the vivacious blooms all around it. 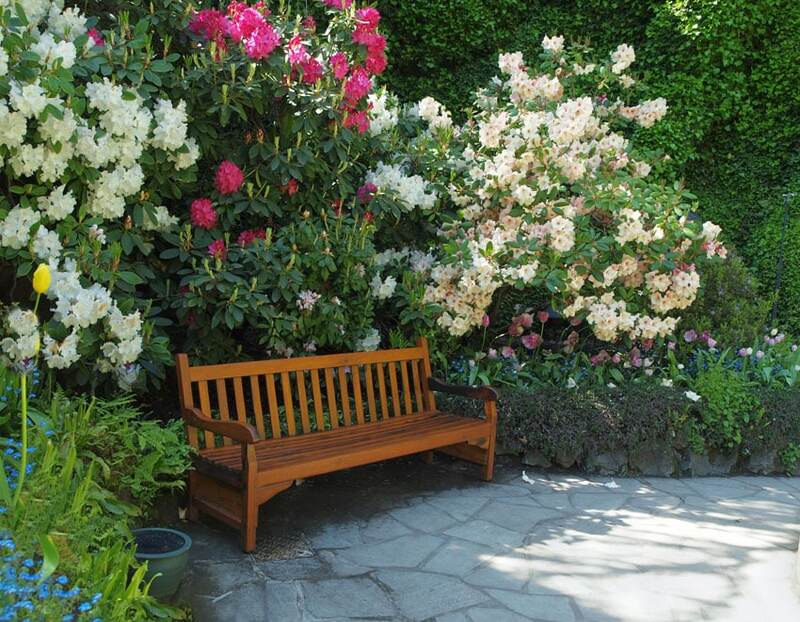 This bench, painted a vibrant forest green, is nestled in between two very busy flower patches, and leads to the wider pebble stone walkways. With a backdrop of red brick wall and hanging ivy, the bench, recessed from the pathway, is a great place to take a rest, even at night, thanks to the presence of solar lighting right beside it. This traditional Tuscan-style garden exudes class, particularly with the linear cast iron railings, with its bottom covered in ivy, alongside its beige cement steps leading to the lower patio deck. On one side, a stone platform exists for plants, and on the other, a unique addition in the form of a light purple cement platform, topped with a matching purple vase ornament. The unique seating area is fitted with a large white seat cushion, decorated with matching silk pillows. This rustic bench made of simple bamboo construction is light, yet sturdy, adapting to the age-old adage of bamboo being bendy yet unbreakable. The flower trellis right behind the bench is also of a quaint bamboo construction yet holds a wonderful array of hanging flowering plants. A simple concrete brick path is used for the backyard patio and complements well with the bright green of freshly mowed lawn. This very basic yet highly functional bench features a series of weathered wooden slats standing on top of two sturdy concrete base pillars coming out of a white sand pit. 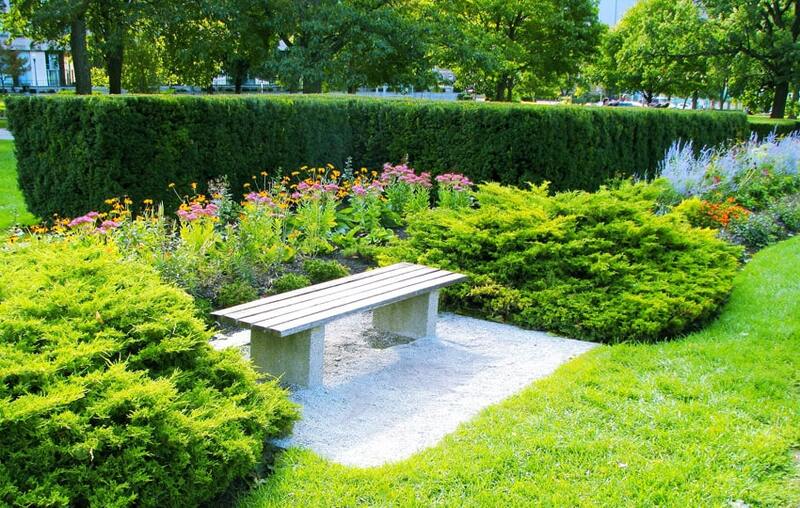 The white sand pit and pale tones of the garden bench contrast so well with the green grass, hedges and bush all around it, and give it an almost Modern zen appeal amidst the garden setup. 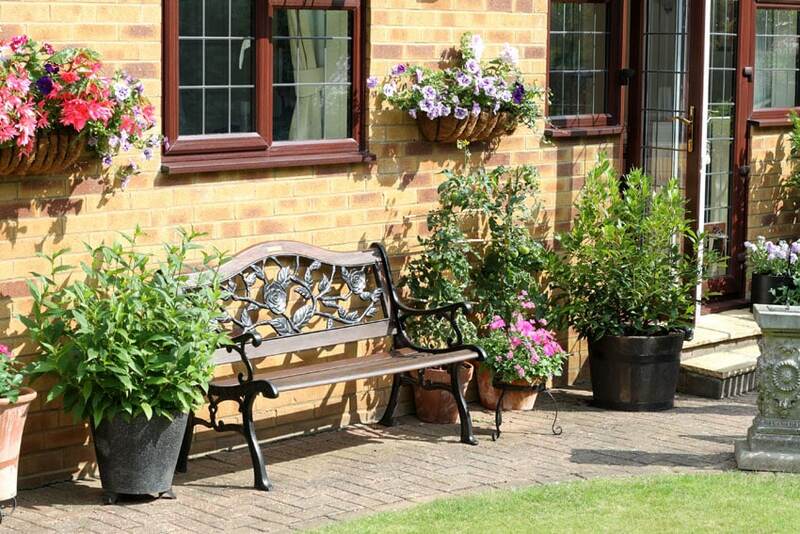 This is a good example of how outdoor bench ideas don’t need to be extravagant when you have inviting garden views. Nicely tucked in between two large hanging plant pots, this classic wooden seated bench blends naturally with the red brick wall and floors and classic varnished door and window frames. To enhance its elegance, the bench design also features a flower and leaf motif in wrought iron on the bench’s backing, as well as on its side arm rests. Plants pots on the ground add warmth to the entire garden setup.